Larger Project 5-3, Guesthouse Kitchen » Roger Perron Inc. The guesthouse kitchen with built-in TV, which can be viewed by those at the outside bar seating. Notice the stool at the left and partial window end. This indoor and outdoor bar counter has two-sided seating for a total of five people. 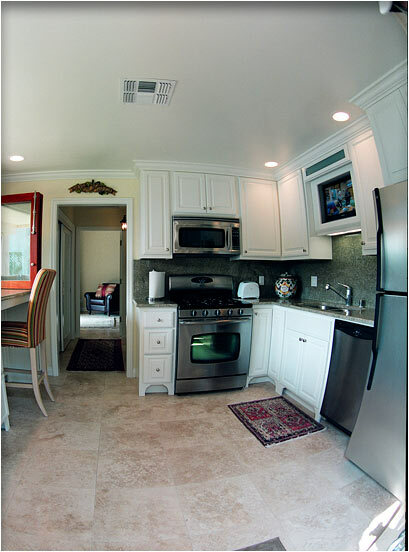 The cabinets are painted white with granite counters, the same as the indoor/outdoor counter pass-through. The floor has 18″ stone tiles, which also run into the guesthouse bedroom beyond.